Oh sweet creature from the ocean, get inside my belly! My, my what a handsome octopus! 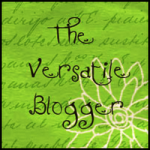 Its been awhile since my last post and I wanted to say that my time away from blogging has not been spent frivolously. I’ve been working on business plans for my new catering start up (stay tuned for the unveiling soon). I’ve been spending lots of time and having a blast in the kitchen experimenting with new recipes. Particularly tapas style dishes, or meals that entertain. For some reason, I’ve had octopus, aka pulpo on the brain, and I’m no stranger to this mysterious creature, as I grew up with it on the table (my Mama’s famous ensalada de pulpo, yum!). I just want to learn about the different approaches to octopus and adapt some recipes of my own. 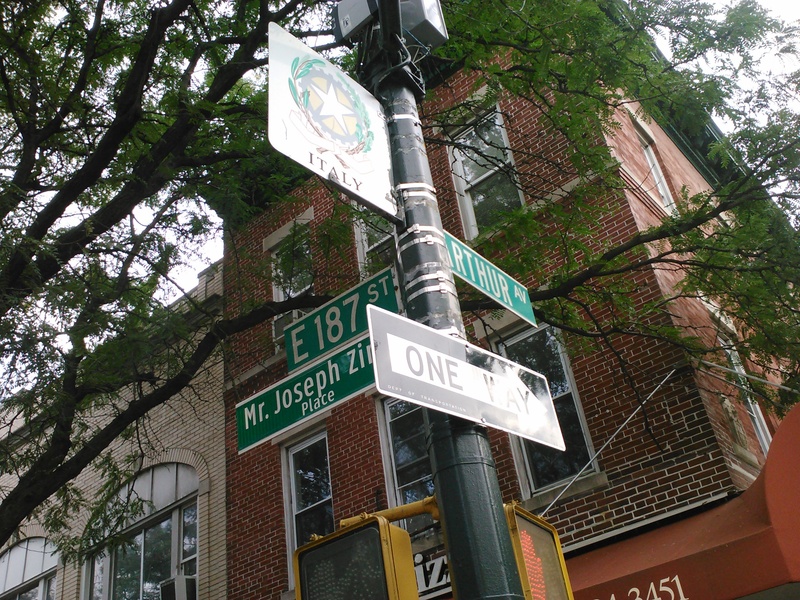 The other day, I went on a quest to Little Italy on Arthur Avenue to a fish market notorious for super fresh seafood. It was a little pricey, $22 for a 3.5 lb octopus but I knew it would be worth every penny! The superior quality would make a big difference in my recipe. If you ever visit Little Italy, be sure to stop by Cosenza’s fish market, in business since 1918. In my mind, octopus is not a fish nor is it a meat, but perhaps an integration of both? At least when it comes down to taste. (Actually, if you want to get technical, its a cephalopod, an ocean dweller). You can compare it to the texture of chicken breast with an essence of the sea flavor. If you can get past the purplish- pink color and the alien- like tentacles covered in suctions cups (note: you can always remove them) you are in for a wonderful treat!! Suction cups, up close and personal. 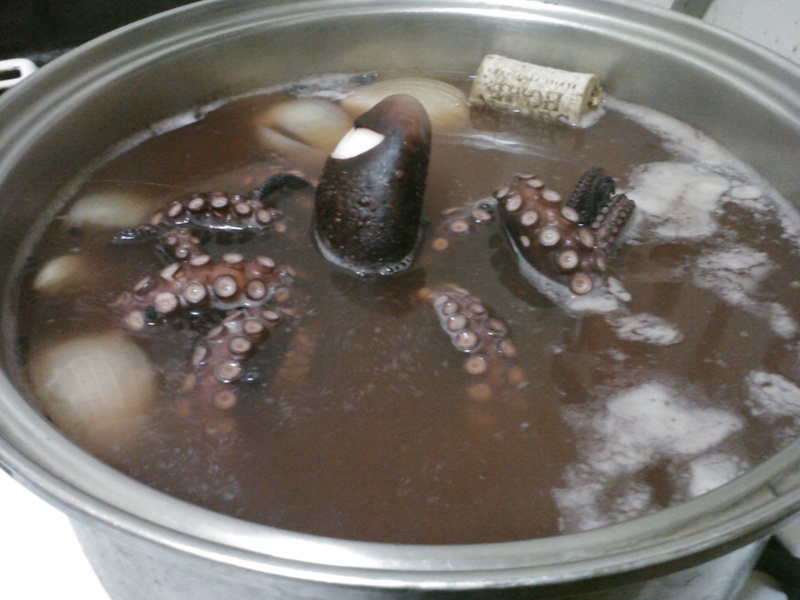 Octopus submerged in simmering broth, I added a cork because its believed to help tenderize the delicate flesh. Octopus can be a tricky thing to make. If cooked for too long, it takes on a tough, chewy consistency, no bueno!! If you use too much acid, like in a salad, it might become too fibrous. If boiled in water for too long, it dilutes the natural “sea” flavor. There are methods to render a more tender octopus. 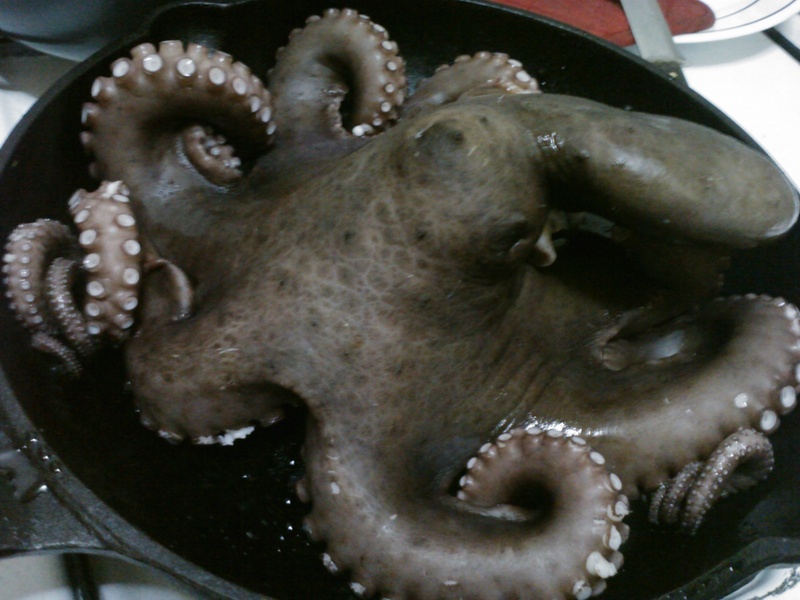 Some beat the octopus, because it literally bruises the flesh, but I refuse to treat my food that way. 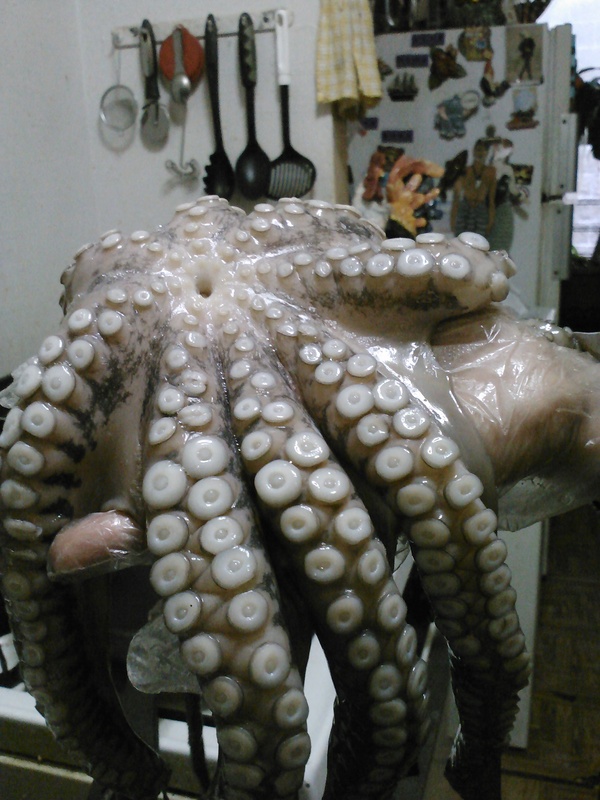 Others say that if you purchase a fresh octopus, freeze it and then thaw it out slowly, which can tenderize it. Unfortunately I didn’t have the two days required to freeze and then to defrost. I also read in a Spanish recipe somewhere that suggested dipping the octopus into boiling water 3 times for up to 10 seconds each time, then simmer for 2 hours. Okay, that works for me. Another method, which seems silly, is to place a cork in the cooking water. It didn’t hurt to try. In the end, the last two options are what I went for. I prayed for some tenderness! 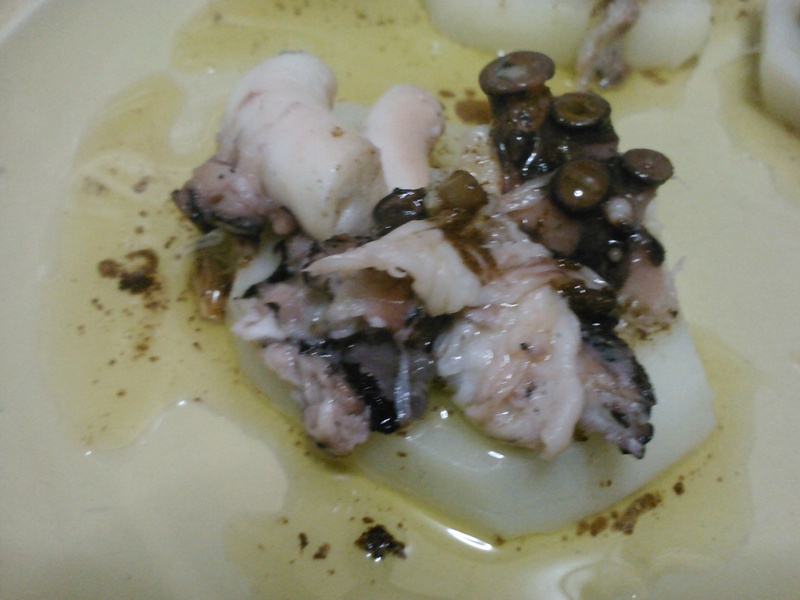 Sauce made of olive oil, sliced garlic, paprika, fresh lemon juice, octopus water. First, I filled a large stock pot with enough water to submerge an entire 3.5 lb octopus, and brought it to a rumbling boil. 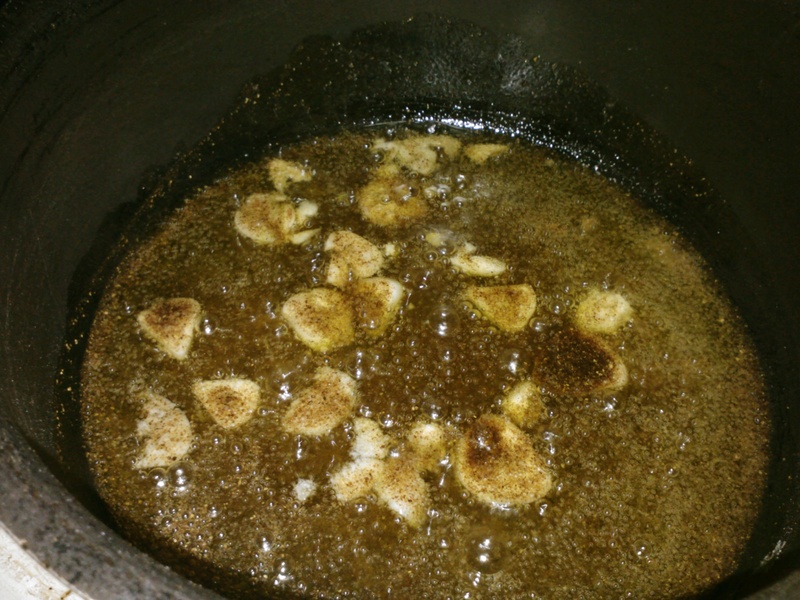 To the water, I added 4 fresh garlic cloves, 2 bay leaves, 2 tbsp of red wine vinegar, one medium white onion, cut in half. 1 tbsp of peppercorns, and sea salt to taste. Then with a pair of tongs, I submerged the octopus 3 times for about 10 seconds each time. I covered the pot, and allowed the pulpo to simmer for 2 hours, turning it every so often. About an hour into cooking, I peeled 4 large Idaho potatoes, cut them into 1/2 inch slices and placed them into salted boiling water until tender. As for the sauce, which ties the dish together, I took a cup of extra virgin olive oil, about 3 garlic cloves, sliced, the juice of 1 lemon, 1 tbsp of paprika and 1 ladle full of octopus water in a medium saucepan over low heat, allowing the flavors to mingle. To assemble, cut the octopus into half inch chunks, place on top of potato slices, douse it with the garlic- paprika sauce mixture, and serve with a glass of tempranillo. Enjoy. P. S. The triple dunk and cork method definitely worked, because the octopus was tender and delightful. You can’t go wrong with a little love and top notch quality.